Ariana Grande concert | Many people die in Manchester city suicide bomb attack. Day has broken over the stunned English city of Manchester, coping with the aftermath of a suicide bomb attack that has left 22 people dead including children, and saw around 59 taken to hospital. Many more injured were treated at the scene. Greater Manchester Police said they received reports of explosions during an Ariana Grande concert at the Manchester Arena just before 10:35 p.m. local time on Monday night. Chief Constable Ian Hopkins told media that a lone individual carried out the attack with an IED, and that the attacker died at the scene. He said that police were “working closely” with the U.K.’s national counter-terrorism network. “I am so so sorry. I don’t have words,” Grande tweeted after the atrocity. “Words cannot express our sorrow for the victims and families harmed in this senseless attack,” her manager said. Nobody has so far claimed responsibility for the blast. Reuters reports that campaigning for the U.K. general election in June has been suspended in the wake of the attack and says that May will be leading a meeting of the British government’s emergency COBRA committee Tuesday morning local time, to coordinate a response to the incident. The committee is convened during terrorist attacks. Facebook has activated its safety check for the attack. Police have given this U.K. number for those with fears for loved ones: 0161 856 9400. 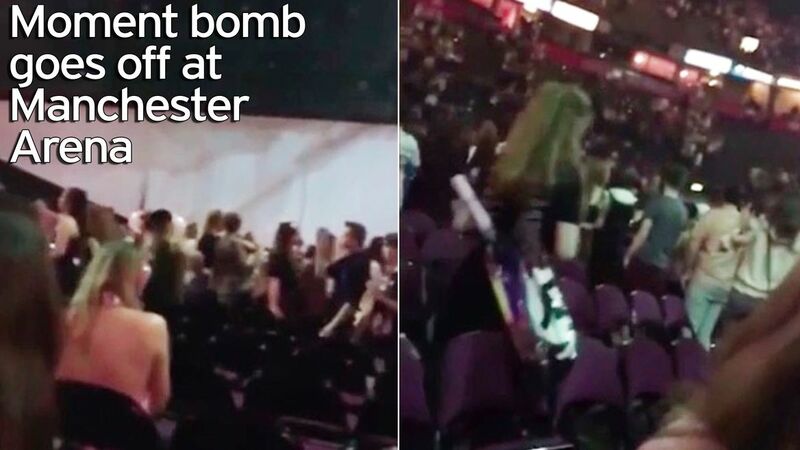 The concert had just ended when witnesses heard two “huge bangs,” according to the Manchester Evening News. Witnesses told CNN that the explosions took place in a box office area outside the main performance venue. Videos posted on social media depicted a chaotic scene as concert-goers fled the arena, screaming. Around 60 ambulances were dispatched to the scene, according to local hospital authorities. Just after 1:30 a.m. local time, police carried out a controlled explosion in the Cathedral Gardens area. Police blocked off roads around Manchester Arena, as helicopters circled the area, according to reporters from BuzzFeed and The Guardian who were at the scene. British Transport Police said all trains from Manchester Victoria station had stopped running, but buses were laid on to transport the many concert-goers out of the area. Karen Ford told BBC News that she had been at the concert with her daughter. “Ariana Grande had left, the lights had come up, everyone was just getting out of their seats and walking toward the stairs when all of a sudden this huge sound, which sounded like an explosion, went off,” Ford said. “A lot of children were there without parents. There was no one to calm them down, so everyone was screaming, crying, pushing,” she said.